In order to provide world wide accessible and convenient training, we are offering the Ihsan Educator Certificate Program™ online for educators and parents who are looking for training based on the type of content offered in a post secondary program in education. The program is suitable in particular for Islamic, International and Private Schools as well as homeschooling parents and networks. Program modules are designed using the latest research by professionals in education to provide teachers with the essential pedagogical skills, reflective practice and professional support network they need to enable students to succeed academically and morally in a global context. 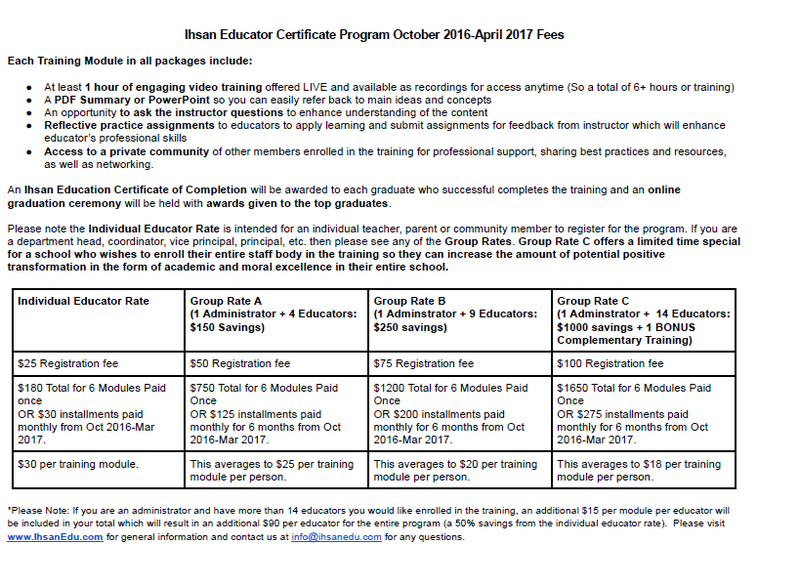 Training based on the type of content offered in a post secondary program in education. The opportunity to earn a certificate in completion from Ihsan Education for completing the program successfully. ​and in the school by discussing practical strategies for character education. This training module will discuss how we can teach for a global context in the 21st century that takes into account a diversity of religions, beliefs, and cultures. It will discuss how we can ensure students are well rooted in the correct understanding of their faith but able to navigate the challenges of and thrive in a diverse society through understanding the importance of social­-emotional learning and teaching students skills such as compassionate communication, dialogue, and conflict resolution. This training module will give you an introduction to inquiry based teaching and learning which is an approach that empowers students to be involved in their learning by encouraging them to use inquiry and critical thinking skills to develop new understandings and ultimately take positive action. In turn students become lifelong learners who are more creative, positive and independent. This is the model of learning used in many private schools and is now being introduced into the public school system in Canada. ​Cooperative learning is an organized and structured way to use small groups to enhance student learning and interdependence. This training module will enable you to plan and implement cooperative learning activities which provide a more enjoyable learning environment and increased student engagement, motivation, retention of information, and the use of discussion and critical thinking and team-­work skills by students which are essential skills for future success. 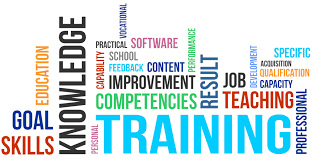 Our LIVE Training Modules are tentatively scheduled for the dates above at 11am EST online and will be available as a recording in your members page. As you may notice, we will pause in December due to winter break and resume in January, so there are a total of 6 modules. Also please note, registration fees will only apply to late registrations starting October 27, 2016. Our first training module will be delivered on Saturday October 29th at 11am EST. Below are the regular fees - please note the payments below include the 30% off special. PLEASE ENSURE YOU COMPLETE THE REGISTRATION FORM BELOW IN ADDITION TO MAKE YOUR PAYMENT BY CHOOSING ONE OF THE OPTIONS BELOW IN ORDER TO ENSURE YOU ARE ENROLLED IN THE PROGRAM FOR 2016-2017. ​PLEASE NOTE NAMES SHOULD ON THE REGISTRATION FORM AND PAYMENT DETAILS SHOULD MATCH. IF THEY DO NOT, PLEASE ENSURE YOU EMAIL US AT INFO@IHSANEDU.COM TO NOTIFY US OF ANY DIFFERENCE. IF YOU ARE CHOOSING ONE OF THE GROUP RATES, PLEASE ENTER THE ADMINISTRATOR'S INFORMATION AND ADDITIONAL INFORMATION ON REGISTERING EDUCATORS IN YOUR GROUP WILL BE EMAILED TO YOU. Refund Policy: Please note, if you wish to withdraw from the program, your fees are refundable subtract a $20 administrative fee and the registration fee if applicable, up until November 30, 2016. Thank you.